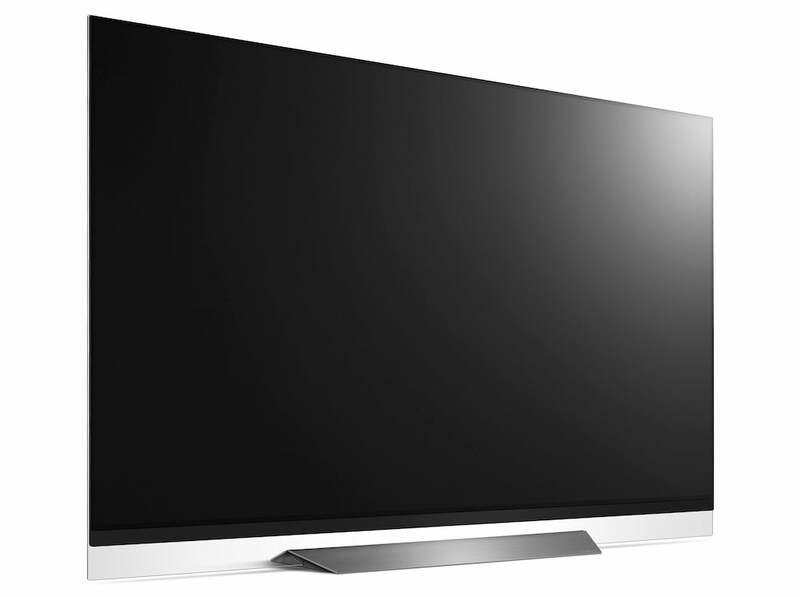 What is the LG E8 OLED? The LG E8 OLED is the first TV we’ve tested from the company’s 2018 range. That’s exciting, given OLED’s dominance of the high-end 2017 TV market. As it was last year, the E series is the step-up option offering a more premium design than the standard C series. The E8 arrives boasting a refreshed design, enriched smart features and, best of all, a powerful new processing engine. Maybe this doesn’t sound all that much on paper – but trust me: that new processing engine matters. It matters a lot. 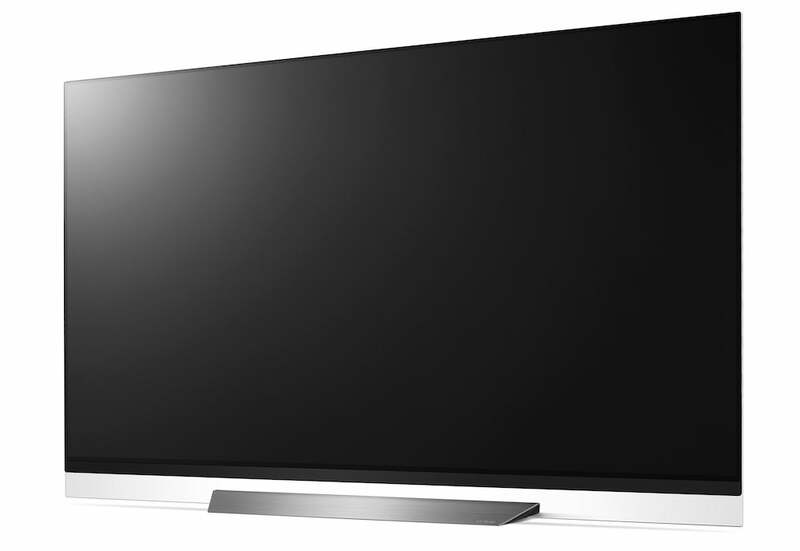 Here we have the 65-inch LG E8 OLED, or by its full name the LG OLED65E8P. It’s also available at 55 inches (LG OLED55E8P). It’s great, but it’s not as good value as the more affordable LG C8 OLED. The LG E8 OLED remains a thing of beauty, but it isn’t quite as glorious as its predecessor, the LG OLED65E7. The latter had glass protruding some distance from all four sides of its frame, which served to exaggerate the incredible slimness of its ‘pixels on glass’ design. Instead, three sides of the LG E8’s frame now look relatively normal in a smart black finish, leaving only the bottom edge to stand out from the crowd. 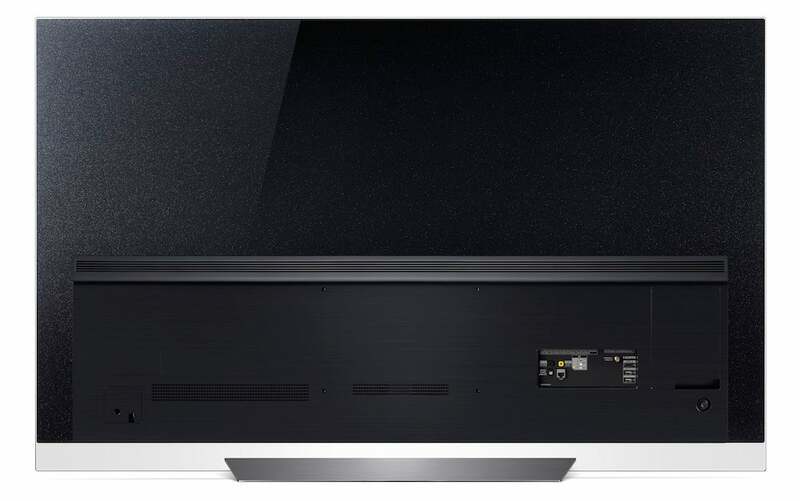 This connects to the TV’s strikingly metallic and minimalist desktop stand via a unique full-width, 2-inch drop of transparent glass. As a result, the screen appears to be floating in mid-air. It’s a cool effect for sure. But, for me, the E7’s design felt that bit more glamorous. Plus, clamping the stand to the OLED65E8’s glass section makes for a pretty terrifying setup experience. That’s not to say the TV isn’t well built. In fact, once you’ve survived the trauma of attaching the desktop stand, it feels more robust than its predecessor. The LG E8 OLED ships with one of LG’s ‘magic’ remote controls. This differs from most TV handsets in two ways. First, it lets you control an on-screen cursor just by pointing the remote at the TV screen. Second, you can navigate up and down its menus with a scrollwheel. Both these control features work well following some practice. Although, if you really can’t get used to them, there are also fallback ‘standard’ navigation buttons on hand. Helpfully, the OLED65E8’s remote provides direct access buttons to Netflix and Amazon Video, and carries a mic for accessing LG’s excellent new voice-control features. Related: Netflix vs Amazon: Which streaming service deserves your cash? LG’s biggest story for its 2018 OLED range (bar the entry-level B8 series) is its new Alpha 9 processor. The extra power this provides has apparently enabled LG to improve pretty much every aspect of picture quality. Also new this year is a more advanced voice-control system. This can understand ‘chattier’ speech, and reaches much deeper into every corner of the TV’s operation. Particularly impressive is the way the system divides the results of voice-content searches by source type (TV tuner, internet, apps). LG is also making a song and dance about its new ThinQ system. Its addition to LG’s TVs enables them to communicate with, and potentially control, other appliances on your home network that support the open-standard ThinkQ platform. Imagine, for instance, being able to receive notifications on your TV when your washing cycle is done. Or being able to tell a robotic vacuum cleaner to set off on a cleaning circuit. LG’s latest webOS smart interface hasn’t changed much from its previous version. This is no huge concern, since it remains a brilliantly simple, easy to customise system. Especially now you can access a useful ‘Recommendations’ service (based on your viewing habits) just by moving the control cursor to the screen’s right-hand side. The LG E8 OLED is on the money with the apps it supports. Freeview Play is on hand to deliver all of the UK’s main terrestrial TV catch-up services, while Netflix, YouTube and Amazon Video are present and able to deliver their full 4K/HDR experiences. WebOS is also unusual in the current smart TV world for offering integrated Now TV support. 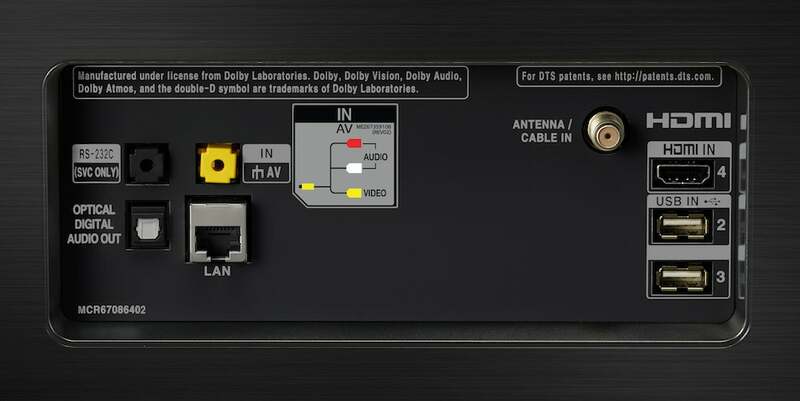 Connections are exactly as you’d expect of a premium TV in 2018, which means highlights of four v2.0 HDMIs, three USBs and both wired and wireless networking options. LG’s HDR format support currently covers the standard HDR10 system, the broadcast-friendly HLG (Hybrid Log-Gamma) platform, and Dolby Vision. That last one adds extra scene-by-scene information to boost compatible TVs’ HDR performance. However, the OLED65E8 doesn’t cover the new HDR10+ ‘dynamic metadata’ HDR system currently being used by Amazon Video, and which is set to appear on 4K Blu-rays by the end of this year. One last feature area to cover is gaming. While LG doesn’t support the auto Game mode switching or variable refresh rate features carried by Samsung’s latest QLED TVs, it does have a few tricks up its sleeve. For instance, it can support 120Hz frame rates (albeit only at HD resolutions). It also supports 4:4:4 colour from PCs, and input lag in Game mode measures under 20ms. Mercifully, the OLED65E8’s HDR Game mode is now as bright as its other HDR presets. No longer do gamers have to suffer a significant drop in brightness when trying to minimise the screen’s input lag. To counter image retention worries raised by the brighter Game mode, LG has introduced a new Logo Luminance Reduction option. This apparently dims bright, static parts of the image – channel logos, gaming HUDs and the like – locally, without impacting the rest of the picture. Personally, I couldn’t see it making any visible difference, even on its high setting. But I guess that’s a good thing. The OLED65E8’s new ‘Alpha 9’ chipset changes some of our usual LG OLED setup advice. For starters, its picture preset selection now represents a much wider set of genuinely usable options. All the presets bar the Vivid one deliver excellent pictures; it’s just a case of finding the one that best suits your tastes, viewing material and room conditions. The Standard preset will probably get the most use, thanks to its combination of high brightness and punchy colours. However, you might want to turn off the Dynamic Colour feature: this can lead to over-saturation and colour imbalances. The Cinema Home setting calms the picture down slightly, and introduces a movie-friendly warmer tone. Although movie fans watching in a dark room may well prefer the Technicolor Expert preset. This offers a natural, balanced image – but it can also exhibit more noise in extremely dark picture areas than the Standard setting. Turning to smaller adjustments, I’d recommend leaving all noise reduction systems off. They can remove the slightly gritty look of some 4K images, but also soften the picture. The Alpha 9 processing improves LG’s motion handling considerably. The ‘Clear’ TruMotion setting now reduces judder without causing as many digital artefacts as it did in the past. Nor are there any of the stuttering problems seen on past LG TVs. I’d still recommend a Custom setting with the Judder and Blur processing components set to three or four. The single most important feature to pay attention to is the new Dynamic Tone Mapping option. This is a step up from LG’s previous Active HDR engine for adding scene-by-scene metadata to ordinary HDR10 and HLG feeds. Its impact is remarkable, so make sure you always leave it set on. The Alpha 9 chipset’s impact on picture quality is nothing short of a revelation. Particularly crucial is the impact it has on the OLED65E8’s HDR playback. With the new Dynamic Tone Mapping feature active, HDR looks far brighter and more dynamic than it ever has before on an OLED TV. So much so that it can deliver HDR images that at times look brighter than those of even the best LCD TVs. The screen’s peak light output on a 10% white HDR window measures only around 820 nits – well short of the figures you get with some LCD TVs. However, partnering this with OLED’s peerless black-level performance and the new Dynamic Tone Mapping option yields gorgeous results. To be clear on this point, it can be argued that OLED can’t deliver the full range of an HDR image as well as brighter LCD TVs. With the relatively ‘middle of the road shots’ that make up most movie-viewing, though, whatever magic Dynamic Tone Mapping is doing pretty much torpedoes the notion that OLED can’t get bright enough to deliver a genuinely exciting HDR picture. The improved brightness makes all of the OLED65E8’s picture presets bar Vivid serviceable. No longer do you have to pick between just a couple of useful modes (both of which, on last year’s sets, had their own niggly limitations). The Alpha 9 platform also tackles other typical LG OLED flaws. For instance, dark scenes now generally look much less noisy than they have on previous LG OLED generations. Especially if you use the Standard preset. The OLED65E8’s extra processing power removes almost all trace of LG OLED’s previous colour noise issue, too. Areas of subtle blends are no longer prone to either fizzing noise, or the strange magenta blocking noise seen on previous LG OLED generations. It’s also a relief to hardly ever spot the vertical brightness banding in detailed mid-dark areas that was at times a real distraction on LG’s 2016 and 2017 OLEDs. This issue hasn’t completely gone; it shows up on test signals, and was still marginally visible on really tough shots. But the number of times I saw it, and its obviousness when it did show up, were both significantly reduced. Traditionally, motion hasn’t been one of LG OLED’s biggest strengths. Here again, the OLED65E8’s Alpha 9 processor makes its mark. In its Clear mode, LG’s TruMotion processing now subdues judder without any of the twitching or pausing problems we’ve seen before. It also delivers more natural, less eerily fluid results, beset by fewer unwanted processing side effects. There’s still room for improvement, but LG has taken a big step in the right direction. You can, of course, choose not to use motion processing – but 24fps movie feeds can still look a little billowy without it. The Alpha 9 processor strikes once more with the OLED65E8’s native 4K playback. Native 4K sources look sharper than they’ve ever looked before on an LG OLED. This is especially true with foreground objects, which actually look more detailed than they do even on the stellar Samsung QE65Q9FN. One final Alpha 9 strength sees the LG E8 OLED transforming LG’s previously rather second-rate upscaling. Sub-4K sources look crisp, detailed and, best of all, largely free of any noise they may have contained in their original form. All these Alpha 9-inspired improvements add up to a substantial leap forward from 2017’s LG OLED models – especially when you also factor in the far brighter, punchier HDR Game mode. These new tricks are allied with all those familiar OLED strengths we’ve admired for so long. Stunningly deep black levels; gorgeously rich colours; complete freedom from the backlight clouding and inconsistencies associated with almost all LCD screens (bar, pretty much, Samsung’s new Q9FNs). That lovely intensity you can only get when every pixel in a screen makes its own light, so that the brightest whites can sit just a pixel away from the deepest blacks. While the OLED65E8 offers a big improvement on any previous LG OLED TV, it does still have a couple of issues beyond the one or two already mentioned. First, some subtle shadow details can become crushed out of very dark areas when images contain a mix of light and dark content. Second, while noise issues have generally been reduced, extremely dark scenes can occasionally still look slightly fizzy. The extra 4K sharpness provided this year also comes with extra grain attached. Colours in the most extreme parts of HDR pictures – such as the brightest blue skies and sunsets – can look a little forced and thin. Finally – and this really is a disappointment – the OLED65E8’s sound quality is only average. Removing the built in sound bar found on last year’s E7 TVs has robbed the E8 of its predecessor’s direct, powerful, bass-rich and room-filling sound presence. The width and height of the sound stage has been reduced too, meaning the E8 does a much less convincing job of exploiting its built-in Dolby Atmos decoding. I’m not saying that the OLED65E8’s sound is shockingly bad. It enjoys a little height and depth beyond the TV’s physical boundaries. Its speakers don’t distort easily either, and trebles and vocals don’t sound harsh, despite there only being a limited supply of bass. However, by reducing its audio prowess LG has removed one of the key reasons to consider stepping up to the OLED65E8 from its own, cheaper C8 series. 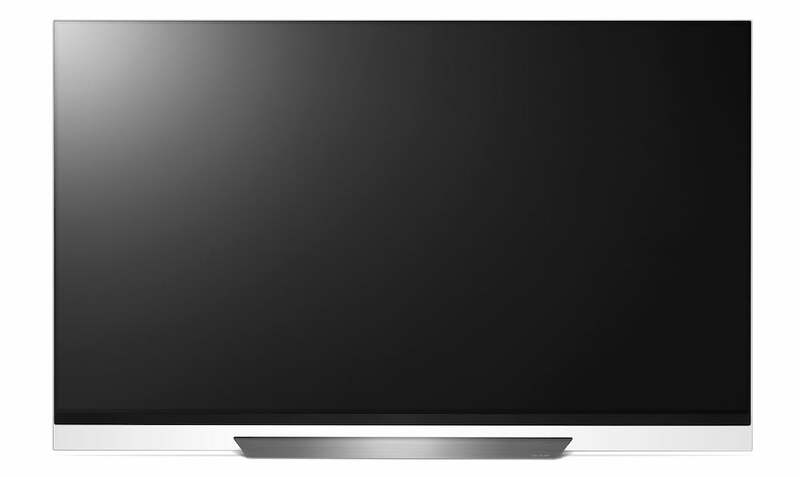 Why buy an LG E8 OLED? 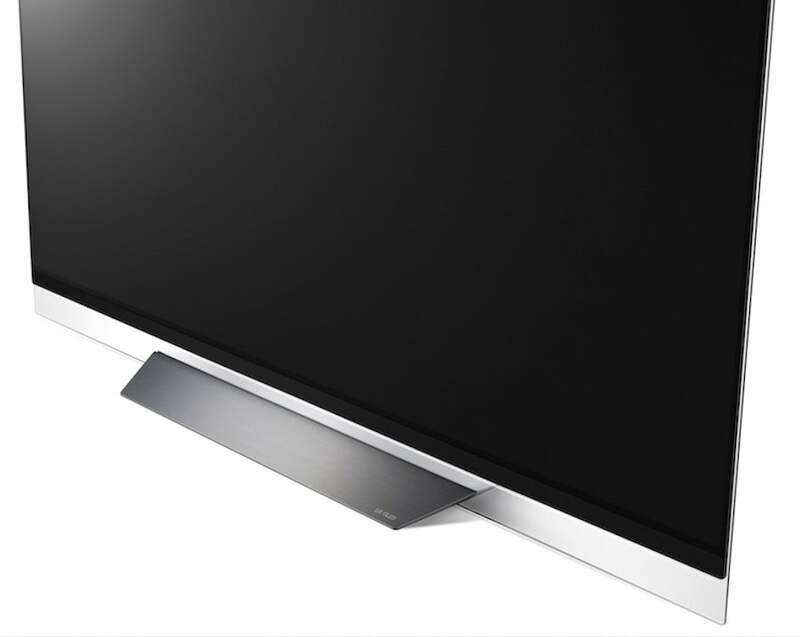 The OLED65E8 produces easily the best pictures we’ve seen from an OLED TV so far. In fact, it’s comfortably more exciting with HDR sources than any other OLED TV seen to date. It also boasts truly unique looks, and an excellent smart system. However, at £4499 it isn’t exactly cheap – which leaves the door open to a couple of rival options. One is the LG C8, stablemate to the LG E8. This costs £500 less, and should deliver almost the exact same picture quality. It isn’t quite as glamorously designed, but that’s the only key difference. 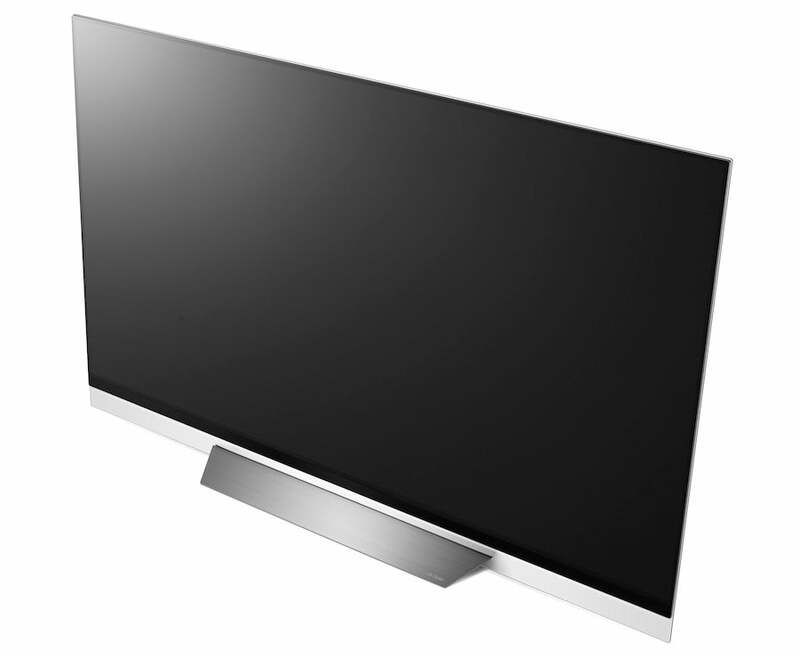 The other big competition comes from Samsung’s QE65Q9FN. This recently reviewed set combines direct LED lighting with hundreds of local dimming zones and Samsung’s unique QLED Quantum Dot technology to deliver the finest, most contrast- and colour-rich pictures ever seen from an LCD TV. At ‘just’ £3799, the Samsung Q9FN undercuts both the LG E8 and the LG C8 significantly. 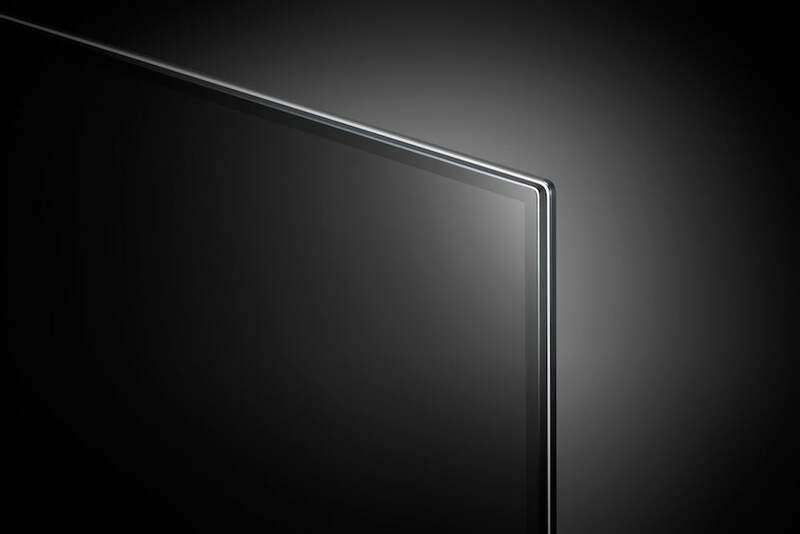 The OLED65E8 beats it in some areas – most notably in design and in contrast during very dark scenes. But the Samsung delivers brighter HDR light peaks, and carries a remarkable anti-reflection screen filter that makes it uniquely easy to watch in a bright room. Nothing short of glorious, but it’s a pity LG has put design ahead of sound quality.